Bones are living tissue, and like all living tissue they rely on blood vessels to bring blood to keep them alive. Most living tissues have blood vessels that come from many directions into the tissue. If one blood vessel is damaged it may not cause problems, since there may be a backup blood supply coming in from a different direction. But certain joints of the body have only a few blood vessels that bring in blood. One of these joints is the hip. This document will describe what happens when this blood supply is damaged and results in what is called avascular necrosis (AVN) of the hip. Another name for this condition is osteonecrosis (which means "bone death"). Living bone is always changing. To maintain a bone's strength, bone cells are constantly repairing the wear and tear that affects the bone tissue. If this process stops the bone can begin to weaken, just like rust can affect the metal structure of a bridge. Eventually, just like a rusty bridge, the bone structure begins to collapse. Some medications are known to cause AVN. Corticosteroids (cortisone) such as prednisone or methylprednisolone are the most common drugs known to lead to AVN. This is usually only a problem in patients who must take cortisone every day due to other diseases, such as advanced arthritis, or to prevent rejection of an organ transplant. Sometimes there is no choice, and cortisone has to be prescribed to treat a condition, knowing full well that AVN could occur. AVN has not been proven to be caused by local injection with cortisone, such as one or two injections into joints to treat arthritis or bursitis. But some patients have developed AVN within the first month of taking these drugs orally (pills by mouth). Patients taking both corticosteroids and statin drugs (cholesterol-lowering medications) seem to have the greatest risk for developing femoral head osteonecrosis. A clear link exists between AVN lifestyle choices such as smoking and alcohol abuse. Smoking causes blood vessels to constrict or narrow thereby limiting the amount of blood flow to an area such as the hip with its already limited backup supply. Excessive alcohol intake somehow damages the blood vessels and leads to AVN. Deep sea divers and miners who work under great atmospheric pressures also are at risk for damage to the blood vessels. The pressure causes tiny bubbles to form in the blood stream which can block the blood vessels to the hip, damaging the blood supply. Then there is a long list of other diseases and conditions that are associated with increased incidence of femoral head osteonecrosis. These are referred to as nontraumatic causes. For example, there is a link between osteonecrosis and more commonly known problems like leukemia, sickle cell diseases, and HIV infection and less well-known diseases such as Gaucher disease, hyperuricemia (a condition commonly called "gout"), and Caisson's disease. The diagnosis of AVN begins with a history and physical examination. Your doctor will want to know about your occupation, what other medical problems you have, and your medication use. You'll be asked whether you drink alcohol. 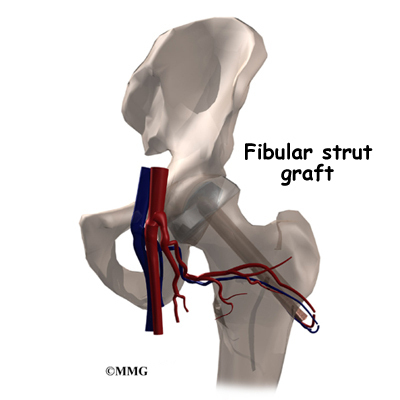 A physical examination will be done to determine how much stiffness you have in the hip and whether you have a limp. Once this is done, X-rays will most likely be ordered. Your surgeon will use these imaging studies to plan the best treatment approach for you. He or she will look at where the damage has occurred, the size of any lesions, whether or not there has been any collapse of the bone, and if any arthritic changes have developed. Based on these findings, the condition will be classified as either mild, moderate, or severe. Once AVN has occurred, the treatment choices are determined by how far along the problem is and your symptoms. Other factors that guide treatment decisions include your age, activity level, general health (and any specific health problems present), and life expectancy. For example, patients with other serious health problems or with a limited life expectancy might be treated with nonoperative care. While the symptoms may be reduced with pain medications and anti-inflammatory medications, no medical treatments will restore the blood supply to the femoral head and reverse the AVN. If AVN is caught early, keeping weight off the sore-side foot when standing and walking may be helpful. Patients are shown how to use a walker or crutches to protect the hip. The idea is to permit healing and to prevent further damage to the hip. Patients may be shown stretches to avoid a loss of range of motion in the hip. Anti-inflammatory medicine is often used to ease pain. Bisphosphonates are another groups of medications that can be helpful. 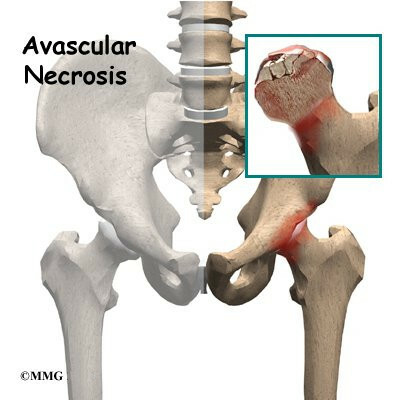 One particular bisphosphonate (fosamax normally used for the treatment of osteoporosis) has been shown effective in reducing the risk of femoral head collapse in patients with avascular necrosis. In some cases, surgeons also prescribe biophysical treatment modalities such as electrical stimulation or shock wave therapy in an attempt to get the bone to heal. Sometimes these measures may help delay the need for surgery, but they rarely reverse the problem. Decompression is often accompanied by the use of bone grafts with or without growth factors, a procedure designed to stimulate bone growth at the site of the defect. The donated bone comes from the patient (taken from the pelvic bone or lower leg). The bone is crushed up into tiny pieces and applied to the hole or defect caused by the necrotic process. The decompression operation (with or without bone grafting) is done through a very small incision in the side of the thigh. The surgeon watches on a fluoroscope as a drill is used. A fluoroscope is a type of X-ray that shows the bones on a TV screen. The surgeon uses the fluoroscope to guide the drill where it needs to go. This operation is usually done as an outpatient procedure, and you will be able to go home with crutches the same day. In cases of small lesions involving less than one-third of the surface of the femoral head, rotational osteotomy has been very successful. 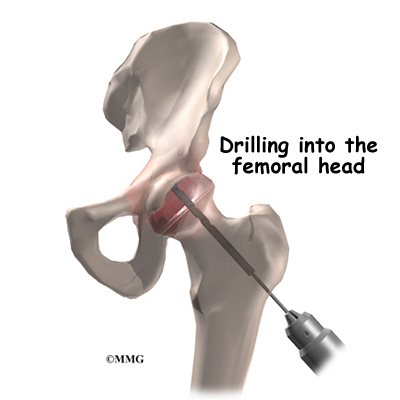 The procedure involves making a cut through the bone and turning the head of the femur so that the necrotic bone is no longer bearing any weight. When AVN is in the advanced stages, the condition is no different from osteoarthritis of the hip joint. Your surgeon will probably recommend replacing the hip with an artificial hip joint. For those patients with a limited bone defect that only affects the femoral head and does not extend into the hip socket, a resurfacing procedure might be considered. Hip resurfacing arthroplasty is a type of hip replacement that replaces the arthritic surface of the joint but removed far less bone than in the traditional hip replacement. Patients who require hip resurfacing or artificial hip joint replacement follow a structured program of physical therapy beginning shortly after surgery.